- Owner of place serving organic food. Do you own or manage a restaurant or place that offers organic food on your menu whether they are all organic dishes or just some? Do you want to drive more traffic to your doors? We can help with that! 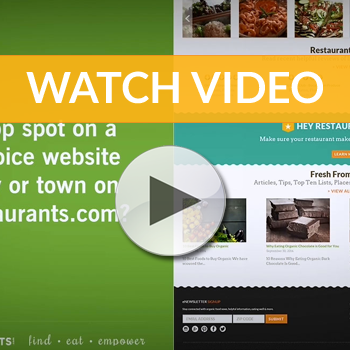 If your restaurant or place is not yet registered as a free listing on our website, then be sure to get it on the list! If it is already registered or once it is, go ahead and claim your listing so you can then manage and promote your listing so it gets more recognition! The process is super easy! See our short Guide to Claiming Your Listing for direction on how to claim your listing. Don't forget to consider then adding your free listing to Premium Placement which gets you to the top of the city results page as one of three spots. As the popularity and demand for organic food grows all over the world, it’s becoming more and more difficult for restaurants offering organic options to distinguish themselves. 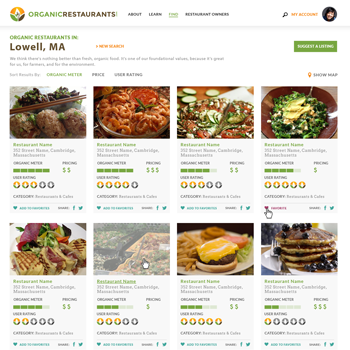 By adding an OrganicRestaurants.com Premium Placement spot to your listing, you get an edge over your competitors! Your listing shows up above all other standard free listings in the area. So when a user on our website searches for your city, then you'll be on the top of the list. We give users all of the information they need to find you in a clear, direct, and concise way with user-friendly search tools from a prominent search field on the front upper area of our home page to a quick city search on the top right section of every one of our pages throughout our site. There are only 3 spots per city at the top of a city’s search results, so grab your spot while you still can! Strut your organic stuff. 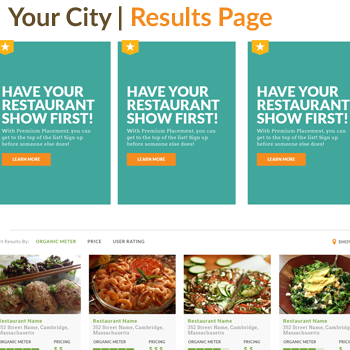 Show that you’re a restaurant or place that wants your users to find your listing with ease at the top of the list in your city and or surrounding cities too by adding Premium Placement to neighboring cities as well! There are very few steps to get to the top with Premium Placement! First, witihin your My Account page and after you have claimed your listing See our Claim Your Listing Guide, you'll choose "Add Premium Placement". Once you do that, then you may choose and add the locations(cities) that you want to be in the top spot. We automatically recommend the city or town that your business is located in, and also provide a list of surrounding towns that you may also add to your Premium Placement spots with us. You know or getting to know your customers best. If your customers, in general, drive from 3 towns over to eat at your place, maybe you choose to have Premium Placement in some or all of those towns as well. As we appreciate that you might add Premium Placement to more than just the town you are in wanting to come up in those top spots in neighboring cities as well, we offer a discount on each additional city that you add to your Premium Placement spots - up to 25%. After the Locations section of adding Premium Placement to your listing, then is the final step which is to add your billing information for just $33 per month, per location. We use the worldwide recognized and trusted payment processor PayPal for all ecommerce transactions to give our listing owners the peace of mind og knowing that we are not storing any credit card information on our servers but allowing PayPal to process all order during check out. After that confirmation, you’re done! You will be able to see your listing in your Premium Placement spot or spots that you ordered the following day! Nice guys finish first! Show off that your restaurant has the best organic offerings in your city or town. Premium Placement gives you an edge over your competitors. Be the first listing to catch a potential customer’s eye! Focused advertising. 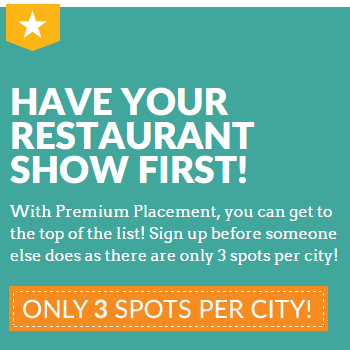 Premium Placement is perfect for honing in on your market. Only buy Premium Placement for the locations that matter to you. Read our Letter to Listing Owners to consider why adding Premium Placement for only $33 per month is a no-brainer! How Many Locations Can I Choose? Once you have claimed your listing, and ready to get your competitive edge by adding Premium Placement to your listing, then you can add as many locations as you’d like. The more, the better as it can be a great idea to add not just the city or town that your listing is located in, but add towns that are close by. You never know when your future customers might be searching for a restaurant that serves organic food in a neighboring town and if you had a Premium Placement listing in that neighboring town – then you’d be top on the list for that town or city as well. We can’t tell you what to do but just explain that the more visible you are within the towns that people are searching for, then the better chance you have of being that prospective customer choice to come eat at! Plus, the first town is $33, but evertyhing after that continues to be discounted so take advantage of bulk pricing! How Long After Purchase does my premium listings show up? Your listing will show up the following day at midnight. Is there a contract? Is it easy to cancel premium placement? There is no contract. It’s a month to month opportunity and you can cancel any time. No cancellation fees and within your account, you can submit your cancel request. Great question and we are excited that you’ve asked or read aloud. The next step is to Claim Your Listing (See our Claim Your Listing Guide). You can do that by simply finding your listing page and clicking on the “Claim” button on the top right area. If you’ve already claimed your listing, then the Next Step would be from within your "My Account" page, just navigate to your “My Listings” tab and then click on the add “Premium Placement” option to your listing and then go through our quick check-out process to secure your Premium Placement listing before somebody else does!.